Sometimes there is just one dog that changes a person’s life. In Morgan’s case it was Tres; a beautiful, black standard poodle that was her heart and soul. Tres led Morgan into the SuperDogs, which led her into SuperDog Central, which morphed into K9 Central. Really, Morgan is all she is today because of this one dog. In honour of Tres’ memory, Morgan, along with a group of dedicated volunteers, provides shelter and love to standard poodles or any breed of dog in need. Because every dog deserves a chance. And every dog deserves a great home. Below are dogs currently looking for their forever home. 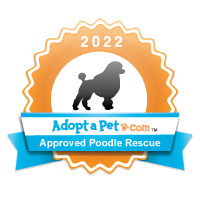 If you would like to contact us, please email: standardpoodlerescue@gmail.com. Would you like to see some of the dogs that we have helped over the last little while? Click here for Happy Tails of dogs who have gone through our program.